To Everything There is a Season: A book that gives us cause to weep from an author who’s best known for his laughs. I simply CANNOT make it through “City Dog, Country Frog” without crying. And not just a couple of tears. I’m talking about the kind of crying typically reserved solely for “Love You Forever.” You know, the kind that makes your voice break mid-sentence, the kind that requires a couple of deep breaths before you can finish reading the rest of the book. 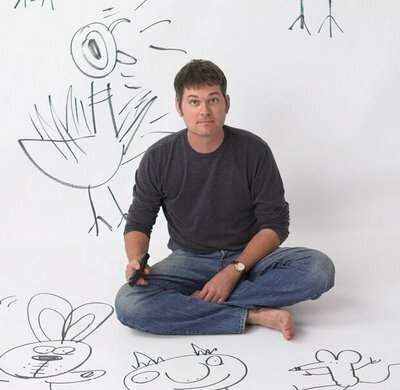 Author Mo Willems got his start in the children’s industry writing comedy for Sesame Street. Probably best known for his hilarity in “Don’t Let the Pigeon Drive the Bus,” he certainly enters new territory with this book. 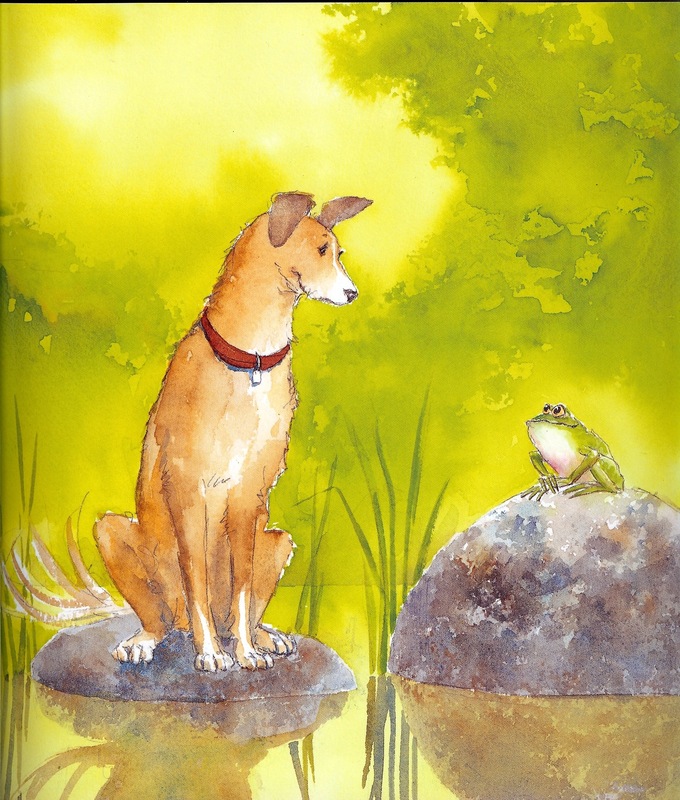 The friendship between a dog and frog seems innocent enough, but as their story evolves, it comes to represent the cycle of life, the inevitability of passing time and how one survives loss. The essence of this story grew from time Willems and his family spent in the countryside of Connecticut. This revelation is imparted to the reader in the most delicate way: through the eyes of the Willems family dog, Nelson. An energetic yellow Labrador Retriever, Nelson was the model for City Dog. “I thought, ‘Wow, if this place is so different to me, what must it be like for Nelson, my born-and-bred city dog,” Willems said. City Dog is, in fact, overcome with excitement on his first spring day in the country. Free of his leash, he bounds through the fields and forest until he comes across Country Frog sitting on a rock at the edge of a pond. “What are you doing?” asked City Dog. And so a friendship is forged. That spring, Country Frog treats City Dog to lessons in Country Frog games. When City Dog returns to the country later in the summer, he comes armed with plans for teaching Country Frog his City Dog games. To this point, the book keeps with Willems’ lighthearted nature. As City Dog and Country Frog learn to play together, we’re entertained by images of the animals’ out-of-character behavior: City Dog hopping like a frog and Country Frog playing fetch. With the book taking on a more serious tone, Willems was stumped when it came to illustrating. His usual doodle-like drawings just didn’t fit. After three years of failed attempts, he turned the book over to artist Jon J Muth. Muth’s style is the antithesis of Willems’. His masterful watercolor images, also seen in Muth’s “Zen Shorts” and “The Three Questions,” are perhaps in their highest form in this book. Muth has captured the light and color of each season. Spring is bright, fresh and lime green. Summer is bold with rich green grass and full blue skies. Muth has not only glorified the beauty of the changing countryside that Willems so admired, but he has also captured the youthful energy of City Dog, with his thumping tail and perked ears, and the contentment of Country Frog in his jovial smile. As fall begins to transform the country landscape, boldly represented with Muth’s palette of blazing oranges and browns, City Dog is as eager as ever to splash and jump and fetch with Country Frog. But Country Frog, like the trees around him, is entering a new season in life. This is where I lose it. Muth’s expressive images and Willems’ spare but poignant words combine for an emotional one-two punch. I see the happy ignorance in City Dog’s eyes and a knowing acceptance in Country Frog’s smile. As they reflect on their seasons together, my heart aches as the celebration of their treasured times conflicts with the anticipation of their relationship’s end. Inevitably, winter arrives. 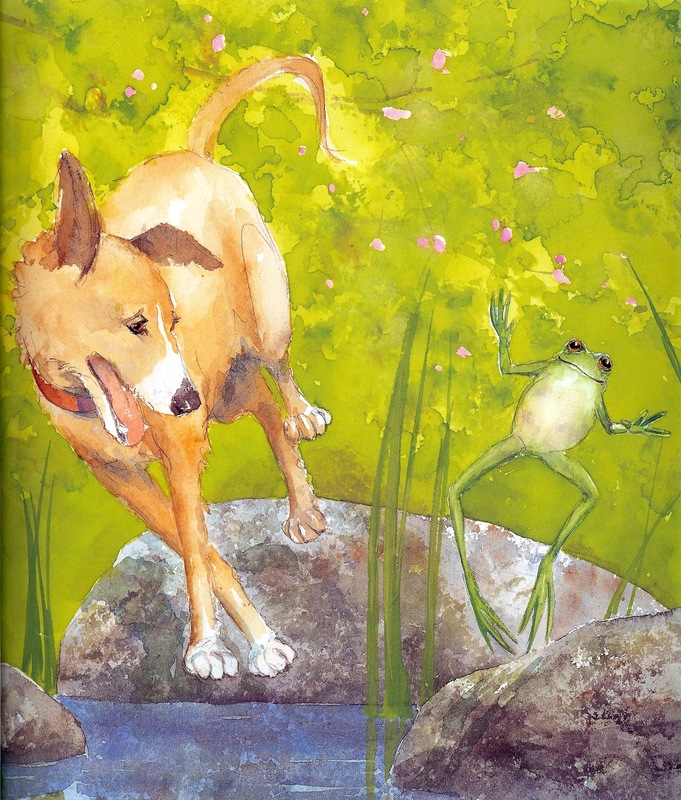 Country Dog flies through the snow to meet his friend, but Country Frog is simply gone. Muth’s image of the confused City Dog communicates the bewilderment one often feels in the wake of loss. Three subsequent images of Country Dog, sitting still on Country Frog’s rock, capture the silent loneliness of grief and the all-encompassing enormity of loss. So why all the love for this cry-fest of a book? As Muth put it during a podcast interview with the New York Times Book Review, Willems is “engaging… the idea of loss in a way that I thought was still comfortable.” Like Robert Munsch and E.B. White before him, Willems pays beautiful tribute to the cyclical nature of life, with its seasons for both joy and sorrow. But Willems’ book, as did “Love You Forever” and “Charlotte’s Web,” reminds us that even in the midst of loss and grief, the lifecycle continues. Love, happiness and birth – of new life or new friendship – arrive as inevitably as death does. Rather than clinging to our grief, these stories encourage us to carry forth what made our lost relationship so treasured. When age and illness take his mother, the son in “Love You Forever” carries on her special tradition, rocking his own baby and singing the song that breaks every parent’s heart. Wilbur, mourning the loss of his savior and friend, pledges unending friendship to Charlotte’s spider daughters. 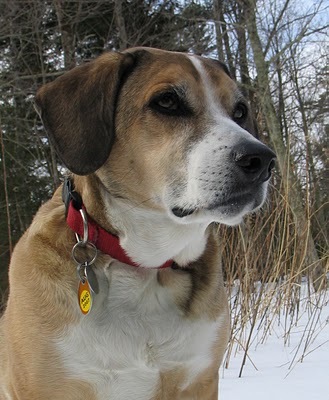 For City Dog, a new beginning comes when spring returns to the countryside. Country Chipmunk finds him still waiting forlornly for Country Frog. “What are you doing?” asked Country Chipmunk. “Waiting for a friend,” replied City Dog sadly. Whether my daughters absorb these subtle lessons is yet to be known. But tears and all, I cherish the reminders this book offers each time I read it: time never ceases to pass but love and friendship survives even death. *The lifespan of a Labrador retriever is typically 10 to 12 years. 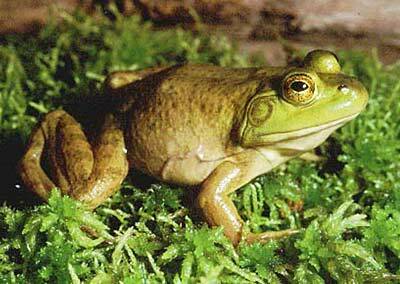 The American bullfrog –which lives in the northeast and most closely resembles City Frog – lives seven to nine years. Surprisingly, these frogs are known to survive the winter by hibernating underwater. According to a Scientific American article, a partially frozen frog will stop breathing and its heart will stop beating, but high glucose concentrations in the vital organs prevent it from freezing completely. When the frog thaws with its surrounding in the spring, its heart and lungs resume activity.